The YWCA Bangkok-Pattaya Center brought the world a little closer to four rural Chiang Rai schools by donating satellite dishes for Internet access and television. YWCA Chairwoman Praichit Jetpai led the Jan. 25 delegation to Ruammitr, Huay Kom, Honghae, and Muang Kham schools, bringing dishes to the first two facilities and warm coats to the latter two. YWCA donated and installed satellite dishes for two Chiang Rai Schools. Both Ruammitr and Huay Kom schools are located in Mae Yaow of the northern province’s Muang District. Ruamitr has 340 students from the nursery level to ninth grade, most of whom are hill-tribe children. Huay Kom teaches nursery through sixth grade and has 186 pupils. The coats brought to Honghae and Muang Kham schools were much appreciated, as the area suffered some of the lowest temperatures in years during the recent cold snap. Warm coats were also given out to a total of 4 Chiang Rai schools. 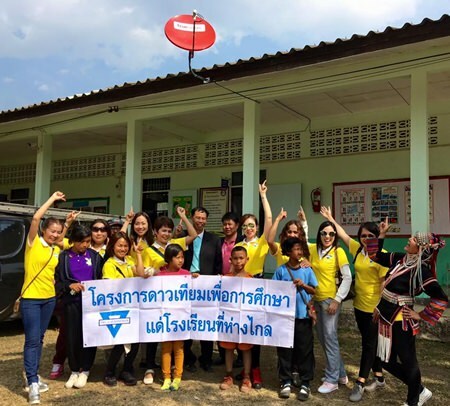 YWCA members said that Chiang Rai and other northern provinces in Thailand are in need of support, which is why the organization reached out under its Satellite Dishes for Education project. By donating satellite dishes, the children will at least take another step further in education and learn how to access the technological world.